Freedom™ Patio Panel Pet Doors allow your pet to come and go as he pleases through your sliding glass door. This door features a heavy-duty aluminum construction and shatter-resistant, tempered safety glass. It's also equipped with the energy-conserving UltraSeal flexible flap system designed to keep the heat and cold outdoors. This Panel Pet Door is specially designed for 81" patio door frames. An exposed sliding glass door frame is visible and exposed in the interior and exterior wall. You can see the track the door slides into. A recessed frame is flush with or barely visible in the interior or exterior wall. You can’t see the track the door slides into. 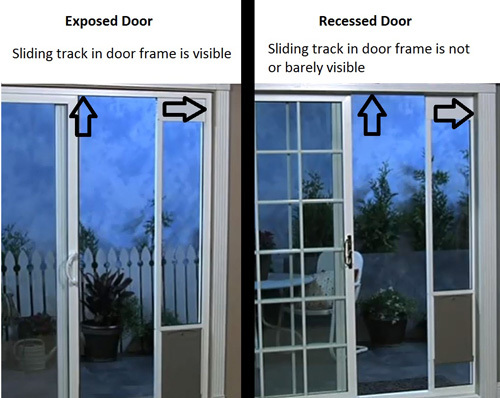 If you have a recessed door, you will need a Patio Panel Kit (not included) to install your pet door. If you live in a colder climate I wouldn’t recommend this! I replace my sweep every year. the glass around the flap constantly freezes then on warmer days melts leaving you a puddle on your floor. I called to ask about a insulated flap for the draft and they don’t make one for this door, they recommend I buy a second flap so I did. It’s worked well for one winter but it ripped the other flap at the top where it bends and by the end of summer and chipped the magnet that holds the flap closed and creates a seal. So now I have one flap warped and won’t seal and the magnets can not be replaced. It’s only been in our home 5 winters what a mistake. In our last house we had a back door that we installed a PetSafe dog door it was good so we didn’t hesitate to buy this.... I’m dissatisfied with no help from customer care on the phone to resolve my issues either. Hi Dacia, thank you for your review! We are sorry to hear that you have had such a tough time with your pet door, and we are here to help! Your product does carry a one-year warranty, and we are happy to accommodate you, and work with you to find a more suitable solution. We'd love the opportunity to speak with you again, if you would please reach out to us at 1-800-457-3911 at your earliest convenience.